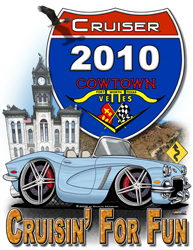 CRUISER PHOTO CONTEST - "What I Saw Along The Way"
You do not have to participate in the Cruiser Program (CCP) to enter the contest - this contest is about showing our Members the neat places you have been in your Corvette. The photo(s) must have you or your Vette in it this year; it does not have to have both. The photo(s) should have the CCP 2010 Sign visible. Must be photo(s) you have taken while cruisin' / participating with your Vette …the photo(s) can be of anything you found interesting along the way – no theme other than non-vulgar …and yes, for this contest, we will even count photos taken if you trailered your Vette, as long as they meet the criteria above. Winner will be selected by MOST POPULAR Member Vote (by photo number on voting slip) at the November Membership Meeting. You are limited to three (3) entries per CTV member. Take lots of pictures all year and select your best ones for entry in November - BE CREATIVE!!! Your Photo(s) MUST BE provided to Doug (or designee) PRIOR to the start of the November Membership Meeting (11/5/10) so they can be added to the Contest Board - which will be displayed for voting. The Contest Voting slips will be passed out, one slip per person and they will be counted by at least two CTV members which do not have a photo in the contest. The Contest Winner and AWARD will be presented at the Annual Christmas Party / Awards Banquet.